Some of the most joy-filled books in the New Testament were written from a small, dark prison cell. Although hungry, cold, and scarred, Paul exalted his savior's love and grace to the Ephesians, Philippians, and Colossians. How was Paul able to rest so securely? And how can you today? The Smart Guide to the Bible? : Paul and the Prison Epistles will brighten your life by illuminating how God is with you in all your circumstances. You'll be uplifted by Paul's instructions for finding joy in suffering, engaging in spiritual warfare, receiving God's love, living out your faith, and so much more. You, too, will be able to rejoice in the Lord always! 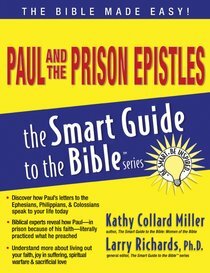 About "Paul and the Prison Epistles (Smart Guide To The Bible Series)"
You want to be healthy, but all those diet fads have left you hungry for something more. There's one Plan for healthy living that's guaranteed to satisfy and that's God's plan! With The Smart Guide to the Bible: Nutrition and Health in the Bible you'll get all your needs met: mind, body, and soul. You'll be amazed at the complete information the Bible contains about nutrition, health, exercise, weight loss, food, cooking, fasting, and remedies. And, of course, it all aligns with the latest in scientific research. No surprise there; after all, God designed the human body and knows what's best to keep it healthy! Get started on the world's most proven health plan today!